If you’ve spent enough time around flowers, you’ve probably seen this. 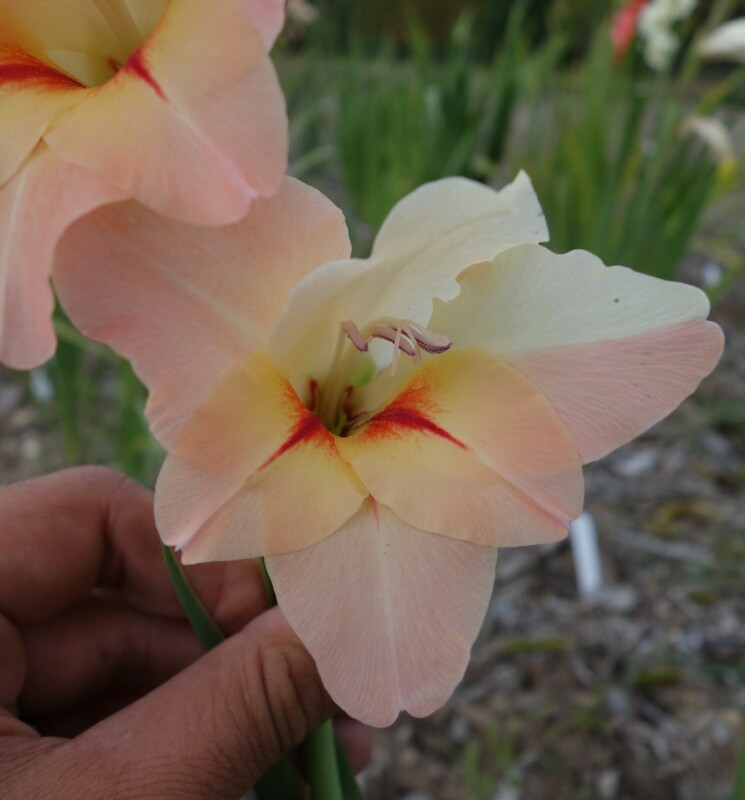 It isn’t exactly common, but it happens, and is so distinctive that you’ll almost always notice when it happens, as I did on one of my gladiolus the other day. Everything else is as normal, but a chunk of the flower is white instead of the usual soft peachy white. What we have here is a sectorial chimera. Chimera means an organism with two (or more, I suppose) genetically different cell types, and a sectorial chimera is when there is one distinct section of the plant made up of a different cell type. And why is this showing up in my usually pink gladiolus? Well, somewhere early in the development of this flower spike, there was a chance mutation in a cell. That mutation stopped those cells from producing the usual pink pigment, so the mutant cells make white flowers. The new mutation and the original cells continued to grow and divide, so some of the flower is from the newly mutated white form, and some is the original cell type. Now, when people hear the word “mutant” they either think x-men or nuclear fallout, but the fact is mutations are a perfectly common, normal part of everyday life for organisms, and of course are critically important to continuing evolution. This type of bicolored flower is cool looking, but certainly a one-off. Sectorial chimeras are very unstable. Next year, most likely, the flowers will just be pink again, or possible a branch will send off pure white flowers. So when you see a sectorial chimera in the garden, take a picture, put it on facebook, and enjoy it because it probably isn’t coming back. This article makes me think of the banks of bonesets (Eupatorium spp.) along the roadsides here in Georgia that are oftentimes populated with variegated plants. I was wondering if they are an indicator of pesticide application, as I’ve seen plants become variegated (instead of dying) when sprayed with a poison. Linda, I have been googling around to see if a tulip that bloomed the other day in a little potted assortment my husband brought home for me is a chimera or not, as well as if it is common or not. Would you be able to provide insight?